In the light of the fruitful cooperation between the Ministry of Communications and Information Technology, through the “e-Learning Competence Center”, and the Administrative Control Authority, On the "Community Culture for the Prevention and Control of Corruption" program. 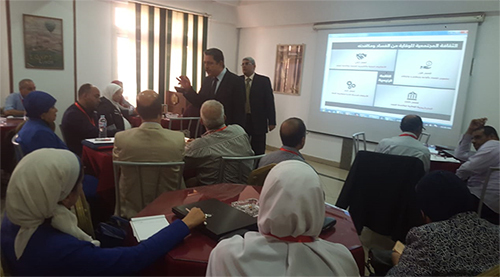 In the framework of this, a number of workshops were held at the headquarter of the National Academy for Combating Corruption, under the supervision of the Administrative Control Authority, from 24 to 26 September 2018. The workshop was attended by a number of employees in all units of the administrative apparatus of the government. The concept of corruption and its types. Code of Conduct for civil servants in the government. Trends in governance and the concept of combating corruption, transparency, and integrity. The course content is available in e-learning format and has been developed interactively by the content development team of the E-Learning Competence Center. The course can be accessed via the Internet by using computers, or portable devices (tablet or mobile). The trainee receives a certificate through the website of the course for completion. Then click on the Course icon, then start the registration process.